Those immortal words were said through a fixed smile in an audible stage whisper by Nancy Reagan. President Reagan and she were walking across the White House lawn to the presidential helicopter, reporters peppering them with questions about an unfolding crisis. Ronald Reagan had paused, and the reporter shouted more loudly something like “What are you doing to resolve the situation?” The President still stood there, speechless, looking a bit befuddled. “We are doing the best we can,” Nancy Reagan repeated again, the same smile frozen on her face. The interviewer’s microphone picked it up, and everyone in the country, it seemed, heard it before the President did. Finally Reagan got a hold of himself and said calmly but purposefully, “We are doing the best we can,” smiled and waved at everyone and climbed up the stairs to the helicopter. The reporter repeated, “The President is doing the best he can to contain the situation, back to you Tom,” and the news flash was over. I sat there, amazed. “Doing the best he can?” Is that all he has to do? I do the best I can all the time, and I still come up woefully short. I go to bed at nights counting all the things on my to-do list I did not get to, all the ways I mucked something up, the many times I arrived late, the days I did not save. But Wait! If doing the best you can is good enough for a President in a crisis, why can’t that be a good enough standard for me? Somehow this was a big revelation to me. No wonder I am a failure, I thought, I just set my standards at the impossible level. I resolved right then and there, to change my standard to “I’m doing the best I can.” The change/benefits have been great. Not as immediate as I would have liked — because old habits, especially kicking myself to get myself to do a better job, die hard. I am still retraining myself to be a “Glass is Half Full” person. Negativism is an insidious thing, hiding in places to blindside me. I have to make a conscious effort, almost minute by minute to look at the bright spots. Some examples: I no longer weigh myself at night, right after dinner. I weigh myself in the morning, when I am the lightest before I have eaten. I am maybe not as thin as I would have liked, but I am holding steady. Instead of reviewing the many things I left undone before I go to sleep, I now force myself to think about what I accomplished. And, most importantly, I do what I told my kids to do a long time ago, I count my blessings. Even on really bad days, there are always at least 3 things I can find to be grateful/happy about. So on gloomy days with April showers, even when it is hard to fight the barometric pressure to be happy, I count my blessings over a warm cup of tea. I am surrounded by love, even when by myself. 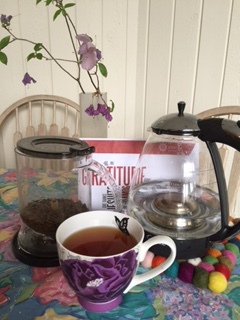 I am reminded to be grateful by the fancy electric tea kettle, the beautiful teacup that was a gift from one of my daughters, and the new-tec teapot from my son. It is a moment of respite from the barking wet dogs, the emails to answer, the meetings to prepare for and the work to do.